When you first approach reading Shakespeare, it can be a daunting experience. Even though I grew up reading books with similar language, I still found Shakespeare difficult unless I had a teacher holding my hand every step of the way. I could just about understand the basic plot line and even some of the language, but many of the jokes, the history, and the language went over my head. Over the years, I have found several things helpful in reading Shakespeare’s plays. With these aids, I am able to enjoy Shakespeare so much more than before as well as understand the plays at a deeper level. Whenever possible, I use an Oxford School Shakespeare edition of the play. Each volume contains a synopsis, commentary, and extensive line-by-line notes on the language, jokes, people, places, and history. There are also discussion questions and a book list in the back for more information. Throughout each book, there are black-and-white photographs of the play being performed. I have grown a lot in my understanding of each of the plays for which I’ve had this version. Another help is to listen to the play while I read. The Complete Arkangel Shakespeare Recordings are the best approach to the play, in my opinion. While many people say that everyone should take parts and read it aloud, I did not feel confident to do so and neither did my children when we were reading various plays as a family. Now, I can listen to Shakespearean actors act out the play on audio while I follow along in print. These recordings are brilliant and make all of the difference in bringing Shakespeare alive. Sometimes I read commentaries on the play. 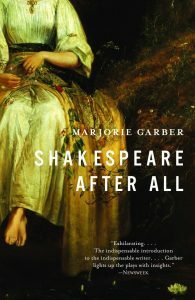 Three books I have particularly found helpful are Harold Bloom’s Shakespeare: The Invention of the Human, The Oxford Companion to Shakespeare, and Shakespeare After All, by Marjorie Garber. All of these books have been a great help in understanding what Shakespeare is doing in the play. I may not always agree with the author, but at least it gives me a starting place in my thinking about each play. Harold Bloom has also written a series, Shakespeare through the Ages, which consists of commentaries on individual plays as well as the sonnets. A tremendous help while reading Shakespeare’s history plays are two books which retell the historical events behind the plays, as well as discuss where Shakespeare chose to diverge from history. These are Shakespeare’s English Kings: History, Chronicle, and Drama, by Peter Saccio, and Shakespeare’s Kings: The Great Plays and the History of England in the Middle Ages, 1337-1485, by John Julius Norwich. A final resource that has been a great help are the two lecture series by Peter Saccio, William Shakespeare: Comedies, Histories, and Tragedies and Shakespeare, the Word and Action. Dr. Saccio is an engaging teacher who “unpacks” each play thoroughly and winsomely. I recommend them. Of course, many teachers recommend watching Shakespeare whenever possible, and we do that, too. In a future post, I will share the adaptations we particularly enjoyed. I hope these suggestions help you in reading Shakespeare, whether you are reading on your own, for a class, or with your family.